May the Lord forgive me. 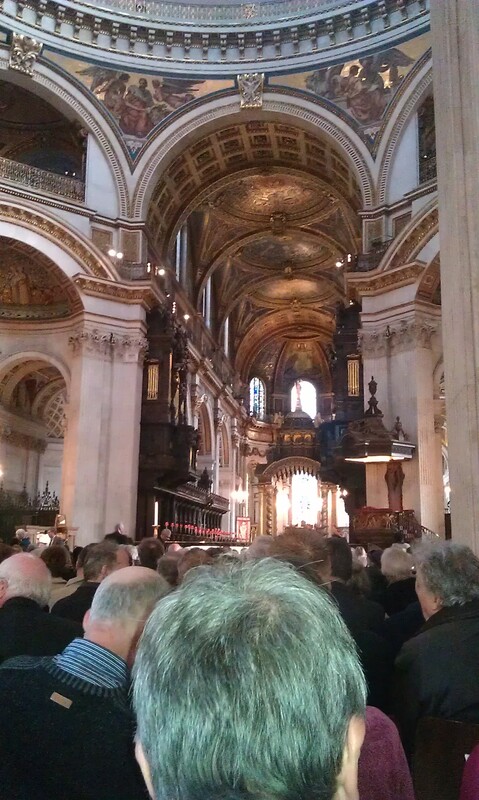 I took this photo illegally at the Service of Thanksgiving for the life of John Stott at St Pauls Cathedral yesterday. Prayers led by Archbishops of Canterbury and York and Bishop of London and tribute from Archbishop of SE Asia. Wonderful sermon from Timothy Dudley-Smith with whom I had a conversation afterwards. Nearly 2000 people from all over the world paid tribute to a great man of God. It was the international flavour which was most moving. John had preached and led missions in every Continent. 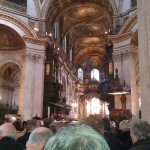 Noel Tredinnick conducted the All Souls orchestra and the whole congregation in rousing singing including Timothy Dudley Smith’s own Lord for the Years. Michael Baughen, who wrote the tune, also led some prayers. Frances Whitehead, John’s secretary for well over half a century, gave a magnificent tribute. Farewell to one of the great Christians of all time. You can read more in my book “Inside Story: The Life of John Stott” (published in America as “Basic Christian”).